ESPN Films’ “O.J. 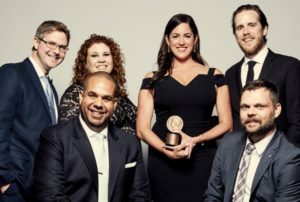 : Made in America” was honored with a prestigious George Foster Peabody Award at the 76th Annual Peabody Awards ceremony, which took place at Cipriani Wall Street in New York on Saturday. espnW’s Sarah Spain was also on-hand to accept an award for the #MoreThanMean PSA she participated in alongside Julie DiCaro for Just Not Sports that highlighted the difficulties female sports personalities encounter on social media. The Peabody Awards recognize distinguished and meritorious public service by radio, television networks, online media, producing organizations, and individuals. Reflecting excellence in quality, rather than popularity or commercial success, the Peabody is awarded to about 25 winners annually.